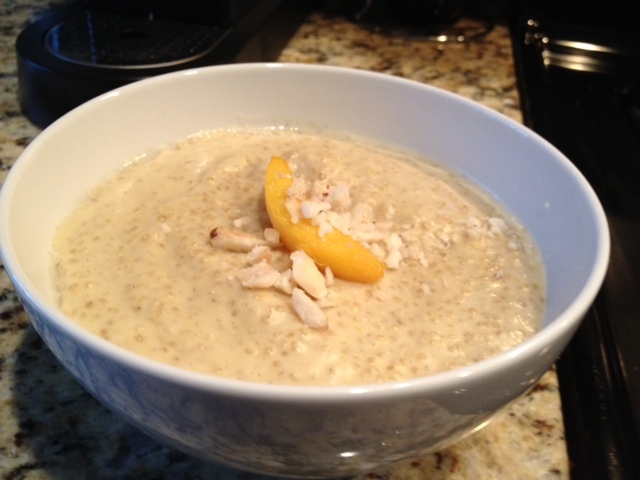 This is my FAVORITE porridge to eat in the morning now! It’s full of protein and fiber. It keeps well overnight too. Sometimes I make it the night before and reheat in the morning. You can easily make this dish non-dairy by omitting the whole milk and increasing your coconut milk. 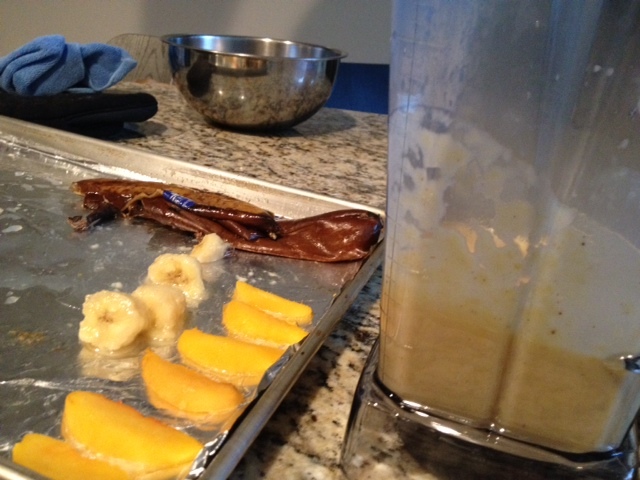 1 Banana (Unpeeled and Whole) *I use 2 bananas because I love the creaminess and body it adds to the porridge but it does overpower the peach flavor, so you decide. You can just use milk if you prefer instead of coconut milk. 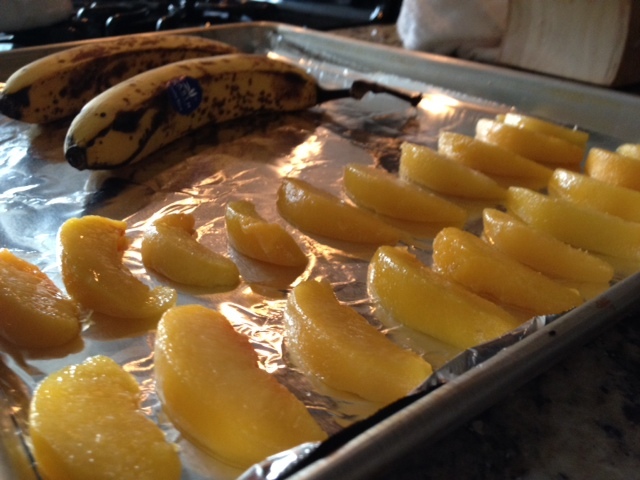 Place the bananas and peaches on a lined baking sheet and roast for 15 minutes. (Halfway through, I drizzle a little olive oil over the peaches). Bring milk and coconut milk to a boil. Whisk a few times to make sure it is not sticking to the bottom of your pan. Once your milk boils, add your quinoa and bring to another boil. Whisk a few times before letting it simmer. Then cover and simmer on lowest heat for 15 minutes. After 15 minutes, the milk WILL NOT all be absorbed in the quinoa. This is what you want. 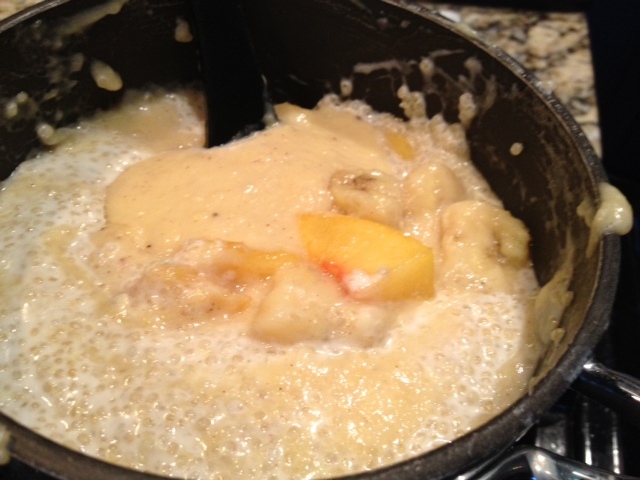 You should be able to see some milk when you add your fruit and puree. Once your fruit is done, put a little more than half of it in a blender and add your honey, cinnamon, vanilla and a splash of milk (you decide which kind). Be sure to fold the whole fruit and puree to your quinoa and cover until all milk is absorbed about 1-2 minutes. I add a pad of butter before serving but that is optional. Top with toasted coconut and/or macadamia nuts. Most people think I am nuts when I say that I really do not care for pasta, but it’s true. If I am going to mix a protein or vegetable with something, I prefer rice. However, if I’m cooking without meat but want more protein in my meal, I will use Quinoa instead. It only takes about 10-15 minutes to make and has 8 grams of protein per cup! It also has 5 grams of fiber. The thing with Quinoa is that once it is cooked, you have to add something to it or it can be dry. Below is my go-to recipe when I need to use up some vegetables or just want to cook something meat free. Once you have cooked your quinoa, add a little olive oil right away and give it a good stir. Then add your favorite spaghetti sauce. Add however much you want. If you add too little, the quinoa will seem dry. Then, saute your veggies in the order listed above. The last thing you want to add is your fresh herb or herbs. Combine your veggies with your Quinoa and top with freshly grated Parmesan cheese. Enjoy! If you have time and want to to add another layer of flavor, you can saute your onion, add the garlic and then add your mushrooms. Let these veggies cook for a few minutes and then add a splash of red or white wine. You will need to let these cook down which will take about 5 minutes. Then you can add your bell pepper and tomato. You can substitute zucchini or asparagus for any of the veggies listed.